Shown here is just about all the information I have about William Woollett the celebrated engraver. The family tree links to a straight download of descendants of Thomas Woollett who died before 1589 and was of East Malling in Kent. This has been compiled from the research of a number of individuals and I am embarrassed not to be listing them all here. Unfortunately I am not sure who they all are. If you have contributed to this research then please contact me so that I can add the appropriate source information and credit you accordingly. As always, I cannot guarantee the accuracy of the information shown in the tree and need your feedback in order to test its validity. Hopefully by the time enough of you have torn me apart for publishing eroneous data we will arrive at a definitive and accurate listing of these historically important facts. Interestingly, although a number of families suggest that they descend from William the engraver, I am not aware that any do. Unless you know otherwise! The family tree of William Woollett the engraver. The will of William Woollett. The following text is taken from "Dictionary of National Biography". William Woollett was a draughtsman and line engraver, son of Philip Woollett, a flax dresser at Maidstone, was born there on 15th August 1735. Shortly after that date his father, having won a share in a lottery prize, took the Turk's Head Inn at Maidstone, and there young Woollett gave the first indication of his artistic talent by scratching the sign of the house on a pewter pot. He was, in consequence, sent to London, where he became a pupil of John Tinney and also studied drawing in the St. Martin's Lane Academy. His earliest plates, which were of a purely topographical character, in the style of his master, by whom they were published, included a set of eight views of Oxford, after Donowell, 1755; four views of the gardens of West Wycombe, after Hannan, 1757; and two views of Whitton, from his own drawings, 1757. His first important work of a higher class was the "Temple of Apollo", after Claude, published in 1760 by Boydell, who then commissioned him to engrave the "Niobe" of Richard Wilson. This established his reputation as the ablest landscape engraver who had yet appeared in England, and was followed by the "Phaeton", 1763 and "Celadon and Amelia", 1766, both from paintings by Wilson; and two admirable plates after C. Dusart, "The Cottagers" and "The Jocund Peasants". So far Woollett had confined his practice almost exclusively to landscape work, but on the appearance in 1771 of West's "Death of General Wolfe", he undertook to engrave it, sharing the venture with Boydell and William Wynne Ryland. The plate, which is his most celebrated work, was published in January 1776, and achieved extraordinary popularity both in England and abroad. On a proof of it being shown to the king shortly before its publication, the title of "Historical Engraver to His Majesty" was conferred upon Woollett. The engraving by William Woollett (1776) of "The Death of Wolfe", painted in 1771 by Benjamin West. The "Battle of La Hogue", also after West, which appeared in 1781, was almost equally well received, and both prints were copied by the best engravers in Paris and Vienna. Besides those already mentioned, Woollett produced about a hundred plates from pictures by Claude, Pillement, Zuccarelli, R. Wright, the Smiths of Chichester, W. Pars, G. Stubbs, J. Vernet, A. Carracci, and others. The last published by him was "Tobias and the Angel", after J. Glauber and G. Lairesse, 1785. "Morning" and "Evening", a pair, after H. Swanevelt, which he left unfinished, were completed by B.T. Pouncy and S. Smith, and published by his widow in 1787. Some of his topographical drawings were engraved by Mason, Canot, and Elliott. In 1766 Woollett became a member of the Incorporated Society of Artists, of which he was also secretary for several years. He resided for some time in Green Street, Leicester Square, and later in Charlotte Street, Rathbone Place, where he died, after great suffering, on 23rd May 1785, from an injury received some years before in playing at bowls. He was buried in old St. Pancras churchyard, his grave being marked by a plain headstone, which was restored in 1846 and now stands at the south-west angle of the church. 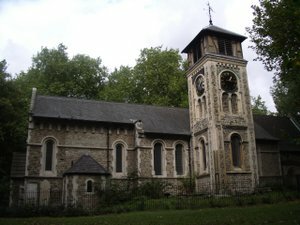 St Pancras Old Church, which was known simply as St Pancras Church until St Pancras New Church was built a little over half a mile away, is believed to be one of the oldest sites of Christian worship in London and in England. Documentary evidence for the early history of the church is scanty, but it is believed to have existed since A.D. 313 or 314. It was the parish church of the parish of St Pancras, which stretched from close to Oxford Street almost to Highgate. However in the 14th century the population abandoned the site and moved to Kentish Town. 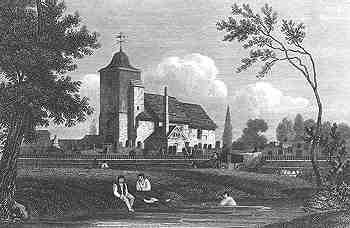 The reasons for this were probably the propensity of the plain around the church to flooding (the River Fleet, which is now underground, runs through it) and the availability of better wells at Kentish Town, where there is less clay in the soil. The old settlement was abandoned and the church fell into disrepair. It lost its status as the central church of the parish when St Pancras New Church was consecrated in 1822, and became a chapel of ease. Throughout the 19th century additional churches opened within the bounds of the original St Pancras parish at regular intervals, and by 1890 it had been divided into 33 ecclesiastical parishes. By 1847 the Old Church was derelict, but as the local population grew it was decided to restore it. There are still traces of Norman masonry, but the building seen today is basically Victorian. A replacement tower was built and the building was lengthened, though it remained quite small. There have been further restorations since, particularly in 1948 following Second World War bomb damage. The building is a grade II* listed building. The architect Sir John Soane designed a tomb for his wife and himself in the churchyard, which is now Grade I listed. Other people buried here include Johann Christian Bach and John Flaxman. There is a memorial tomb for Mary Wollstonecraft and William Godwin though their remains are now in Bournemouth. The poet Percy Bysshe Shelley romanced the future Mary Shelley here. In the mid 19th century the writer Thomas Hardy was involved in the controversial clearance of part of the churchyard to make way for railway tracks to St Pancras station, while he was a young trainee architect. In 1968, The Beatles were photographed in the churchyard grounds, in a famous series of pictures designed to promote the single Hey Jude and the album The Beatles aka The White Album. The churchyard is the largest green space in the locality. It has some fine mature trees, and was restored in the first few years of the 21st century. Among the eccentric characters who lie buried here is William Woollett, the landscape and historical engraver, known by his masterly plates of Wilson's pictures and his battle-pieces; his portrait, by Stuart, is in the National Gallery. He lived in Green Street, Leicester Square; and whenever he had finished an engraving, he commemorated the event by firing a cannon on the roof of his house. He died in 1785, and sixty years after his death his gravestone was restored by the Graphic Society.From: 'St Pancras', Old and New London: Volume 5 (1878), pp. 324-40. Radical politician ('An Enquiry into Political Justice') and writer of one of the best-ever psycho-political novels ('Caleb Williams'). Married to Mary Wollestonecraft, and father of Mary Shelley, author of 'Frankenstein.' Originally buried in Saint Pancras Churchyard, his remains were moved to St. Peter's Churchyard, Bournmouth, England. On the monument it states " Their remains were removed hither from the Church Yard of St. Pancras London a.d. 1851". William Woollett: One of the giants of eighteenth century English engravings, William Woollett came from humble surroundings and was mainly self-taught. Yet some of the most famous English engravings of the era, such as, The Death of General Wolfe, bear his name. William Woollett was equally gifted in all genres, from historical art to architecture, landscape, portraits and figure studies. In particular, his style of engraving landscapes with deep and vigorous foregrounds contrasted with delicate backgrounds became very influential. His famous 'worm line' technique of engraving was imitated throughout Europe. William Woollett was a full member of the St. Martin's Lane Academy and in 1766 he was admitted into the Incorporated Society of artists. In 1775, he received the highest ranking when he was appointed, 'Engraver to the King'. "Here Woollett rests, expecting to be saved; He graved well, but is not well engraved." In part because of this delightful verse a large memorial was commissioned for Woollett in the west cloister of Westminster Abbey where he is now, "well engraved." A mural tablet to his memory, sculptured by T. Banks, R.A., was erected in the west cloister of Westminster Abbey. Woollett stands in the front ranks of the professors of his art, and he was the first English engraver whose works were admired and purchased on the continent. In his landscapes he succeeded, by a skilful combination of the graver and needle, in rendering the effects of distance, light, and atmosphere in a way not previously attempted, and his figure subjects are executed with remarkable vigour and purity of line. In landscape work he has, however, been surpassed by the modern school founded by John Pye, and his prints of that class are now greatly depreciated. William Blake, who knew Woollett intimately, and did not like him, asserted that all his important plates were etched by his assistant , John Browne (1741-1801), and owed entirely to him whatever merit they possessed (Gilchrist,Life of Blake, i. 20). Woollett left a widow Elizabeth and two daughters, who, when the trade in prints between this country and the continent was destroyed by the war which broke out in 1793, were reduced to great poverty, and in 1814 a subscription was raised for their benefit. Mrs Woollett died in 1819, and her husband's plates were then sold to Messrs. Hurst & Robinson in consideration of an annuity for two lives, but, the firm failing six years later, this was lost. In 1843 the surviving daughter, Elizabeth Sophia, then aged sixty eight, was the subject of another appeal for public assistance. 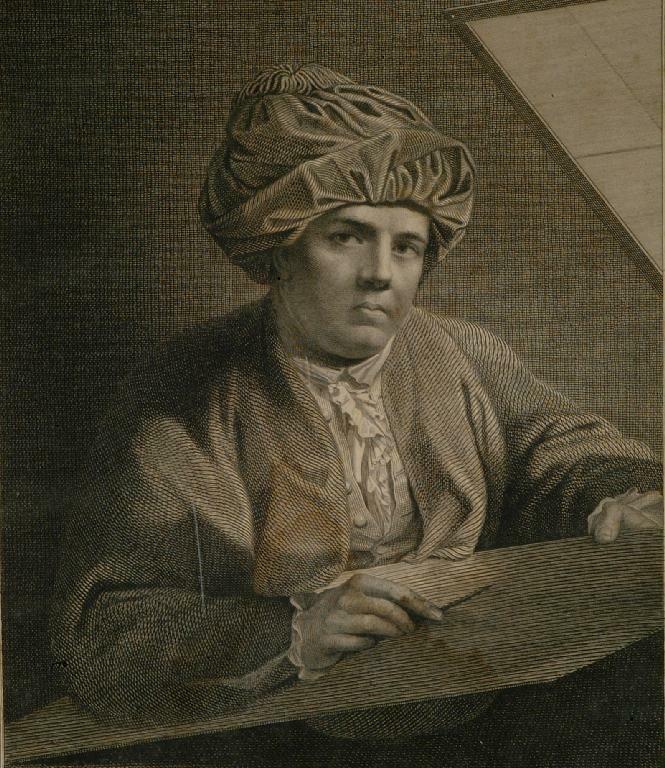 A portrait of Woollett, drawn and engraved by J.K. Sherwin, was published in 1784, and another, by Caroline Watson, from a painting by G. Stuart, in 1785. The portrait by Stuart is now in the National Portrait Gallery, London. A pencil drawing by T. Hearne, now in the print room of the British Museum, was engraved by Bartolozzi in 1794. Fagan's Catalogue of the Works of Woollett, 1885; Artists' Repository, iv. 134; Nägler's Künstler Lexicon; Bryan's Diet. of Painters and Engravers (Armstrong); Dodd's manuscript History of English Engravers in British Museum, Addit. MS. 33407; Carlisle MSS. In Hist. MSS. Comm. 15th Rep. App. Pt. Vi. Pp. 489, 547. .. he fell between the two stools of the accepted landscape tradition. It is significant that his most successful picture showed Niobe in a wild setting of rocks, and that it brought in £2,000 for Woollett the engraver". .. and Benjamin West is said to have made as much as £15,000 out of Woollett's engraving of his Death of Wolfe. Indeed, artists such as M.W. Peters and Francis Wheatley must frequently have worked with one eye on the burin very much as novelists of today write with one eye on Hollywood". Woollett, (William) an eminent engraver, was born at Maidstone, in Kent, in 1735, and was instructed by an obscure artist named Tinney; but he was indebted for the admirable and original style for which his works are distinguished to the resources of his own genius. By an intelligent union of the point and the burin, he carried landscape engraving to a degree of beauty and perfection, which was unknown before him, and perhaps which still remains unequalled. The foregrounds of his plates are as admirable for depth and vigour as his distances for tenderness and delicacy; and in his exquisite prints from the pictures of Wilson he appears to have impressed on the copper the very mind and feeling of that admirable painter. The talents of Woollett were not, however, confined to landscapes, he engraved, with equal success, historical subjects and portraits. The Death of General Wolfe, and the Battle of la Hogue, both after West, are considered his best historical pieces. He was appointed engraver to George III. He died the 23rd of May, 1785, in the fiftieth year of his age, and was buried in old St. Pancras' churchyard. There is a monument to him in Westminster Abbey. Woollett was universally beloved for the excellence and amiability of his character.